I used to be so meticulous in my preparation. I would plan my nutrition and hydration strategies days before a race. I would stop drinking alcohol a couple of days before, a week or more for a marathon. On the night before I would pin my race number (pre-crumpled for aerodynamic purposes) to my shirt. I would eat breakfast 3 hours before the gun. I would schedule my movements. On Sunday I woke after a very few hours sleep with no porridge oats in the house, to discover I had no gels left. I cleared the empty bottles from the kitchen. For breakfast I tried something new (never do that before a race, but never): Oatibix. They are not pleasant, but the faint nausea at least staved off the hunger. I drank some coffee, thought about it, woke Nicky and persuaded her to drive me the 20 miles to Ely. I spent 15 minutes calculating logistics, which centred on whether I should wear shorts with pockets, in which I could keep a key and my phone, or my nice lycra knee-length tights. I went with lycra, the visually pleasing effects of which were cancelled out by the poky running vest. The Turing Trail Relay is named after Alan Turing, the Cambridge computer wiz, who used to run along the river bank -- the Great Ouse and the Cam -- between Ely and Cambridge. The race extends from Ely Cathedral to Jesus Green in Cambridge, along the west bank, and then back again along the east bank. It's about 36 miles and is divided into 6 stages. I was scheduled to run Stage 2, from Dimmock's Cote to Waterbeach, with a Cambridge and Coleridge team (the slow men's team); but I also needed to get a long run in, as part of my training for London next month. The perfect solution. Nicky dropped me off in Ely. I said hello to the runners from my club, all waiting for the starting gun, and then started to run stage 1, with a fifteen minute head start. I ran past the cathedral, to the river, and along the bank. It was a beautiful morning, cool at first, but bright and clear. The race logisitics were excellent. Even I didn't get lost. It's hard to lose a river, though. There were clear arrows, and the race marshalls were in place as I made my way, jogging eight-minute miles on the firm footing. A few weeks ago it would have been hell. I stopped to take some photos with my phone. Six miles later, I arrived at the stage 1 / 2 handover with just a few minutes to spare. The marshalls stood ont he bridge by Dimmock's Cote staring at me, wondering how I could amble at that speed and get such a large lead on the field. I disabused them, stripped off my gilet and handed it with my water bottle to Adam, the team co-ordinator. In my vest I was ready to run. A minute or so later, Tom handed over, and I was running legitimately in a race. After about 30 seconds, I was passed by a very tall heavy footed runner in a bright shirt. This was depressing, especially as I was running a sub-six-minute mile. Over the next six miles I passed three others. I said good morning to one, but he didn't respond. We passed a couple of walkers, but nothing much else happened. I was left alone with my thoughts. It was all quite pleasant in a Sunday-morning-ish sort of way. Sometimes the fens are perfectly bearable: when it's sunny, when there's a clear difference between river and soil, when there are no people around, no Alsatians to savage you (I can't believe I forgot to blog that), just you and the clay air of east anglia. Approaching Waterbeach things were more familiar. I ran this way a few times last year. I think the last time was when I made it through a field of very jumpy cows, unnerving me a little, only to find, on the gate at the far side of the field, a sign saying "Beware of the bull". I had no choice, really, as the other way home was an extra thirty miles, and I only had one bottle of water. As we approached the end of the stage I thought I stood a chance of catching Mr Yellow Jersey. He'd stopped gaining on me and had been an even 200m for a couple of miles. In the last mile I pulled this back to about 30m. He was now my mortal enemy. 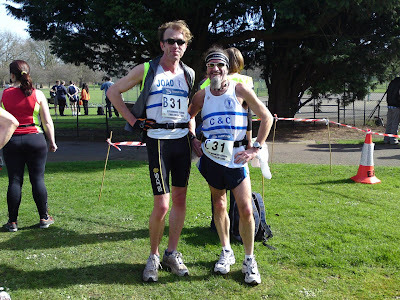 But the finish came too soon, after a little wrinkling around Waterbeach, and he kept his 30m. 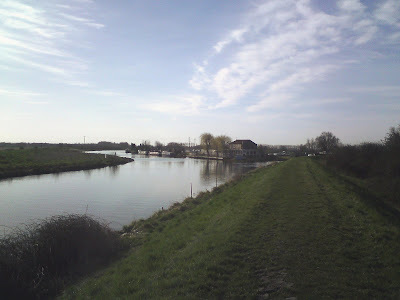 I handed over to my team-mate Peter (who appears in a photo below), and he disappeared along the towpath that reaches from Waterbeach to Cambridge. I chatted to some people from the club, and then started running again. I ran, this time, to the end of stage three, at Jesus Green, where I often walk Mercury and run the odd interval. Strangely only a couple of people passed me, one of them when I was speaking to an acquaintance who was marshalling the event. The towpath was an obstacle course, owing to some pointless rowing event. I paused to take a photograph, and spoke to Peter and his wife. Here we are at the end, in matching outfits. Then I lifted my heels and ran around Jesus Green a couple of times, just to make sure that I had done at least 20 miles. You could call that last couple junk miles, but they may well be the only thing that keeps me going 22 miles into London. Or there I may learn that haphazard preparation is no barrier against that lonely pain that wells up after mile 22. I have seldom enjoyed a long run quite so much, which perfectly legitimises the insanity of running three consecutive stages of a six stage relay, and racing the one in the middle. I commend it as a useful part of anyone's training plan. Then I went home and ate bacon and poached duck eggs with Nicky, and drank a fine bottle of 2005 La Bolida (costieres de nimes). Some aspects of preparation I have down to an art.